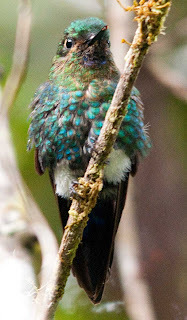 The Black-breasted Puffleg has an extremely limited range on the northern slopes of the Pichincha volcano near Quito, the capital city of Ecuador. Little is known about it but there is much that has been presumed although not verified. 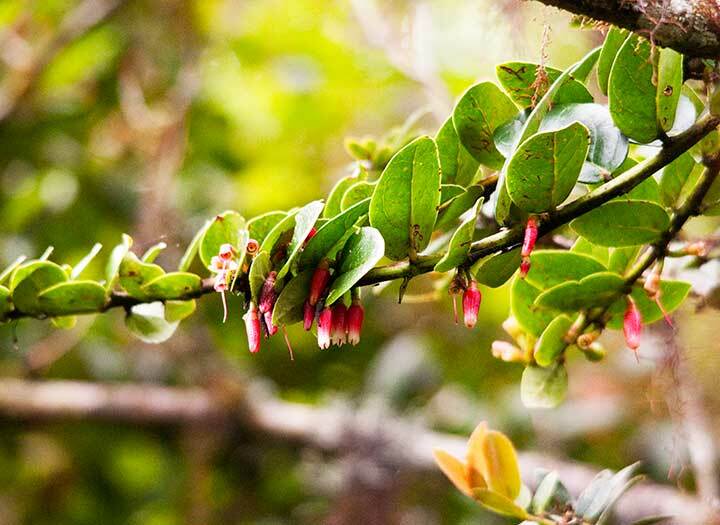 During the months of May through September it can occasionally be sighted at the Yanacocha Reserve near Quito and the Verdecocha reserve a little further west. Outside of these months it is assumed to migrate to higher altitudes where it breeds during the months of January through March. My first observation of the Black-breasted Puffleg was on June 5, 2012 while at the Yanacocha Reserve. I had looked for it many times in the past, during its more prominent months, but had always come away empty handed. This trip was different and I not only observed a young female but also was able to acquire several good photos. Most of all I spent much time observing this little creature in hopes of learning more about its habits and increasing my chances of encountering it again. After several emails with Jane Lyons, a local ornithologist, about my sighting, I decided to return to gather more information. On June 16 I viewed both a male and female in the same area as the first. I will admit that my first sighting was by luck. It had everything to do with being in the correct location. The Black-breasted Puffleg does not vocalize much, a tiny chirp perhaps every few minutes while perched. It made no sound while flying other than the hum produced by its wings while fluttering from flower to flower. This is what attracted my attention and allowed me to see it for the first time. Once it was located it was a matter of following its flight, which was generally short in duration. This little hummingbird has a short beak and was feeding on flower buds from the surrounding trees. (Ericaceae Cavendishia) There were larger flowers in the area but it remained at the blossoms that had shorter depths. It would forage for a minute or two and then perch for several minutes. When seeking out this species it would be necessary to sit quietly for a period of time to give it a chance to fly before it can be observed. Patience is the key. During my first visit I observed a female feeding about 2 – 3 meters off the ground and perching 2 meters high on bare branches. The day was slightly overcast but generally warm for the area. (10o C) During the second sighting I watched both a male and a female feeding in the same area but when it rested it was generally in heavy cover and no more than 1 meter from the ground. This day was cooler (7o C) and overcast with clouds rolling in during the observations. Both sightings were in the same location along the black-breasted Puffleg trail about 50 meters from the main path. The foliage is fairly dense but opens into a clearing of roughly 20 m diameter. There were several other understory bird species in the region including Rufous Antpitta, Rufous Wren, Barred Fruiteaters and Stripe-headed Brush-finch. Both Glossy and Masked Flowerpiercers could be heard higher in the trees but were never seen in contact with the Puffleg. I know that I have not provided a lot of information but hopefully it is enough that a person might have a better chance of spotting this seldom seen bird. It is always a pleasure to observe a species of this caliber. I know of many avid birders who have searched for years without ever seeing this magnificent creature. If all goes well, with this data, a little luck and a lot of patience others may be rewarded with a peek at the Black-breasted Puffleg. The Birds of Ecuador by Ridgely and Greenfield have maps showing the range of the birds in your area. Also, Fieldguide of the Birds of Ecuador by McMullen and Noverette has range maps.